The Game Boy Camera is an official Nintendo accessory for the handheld Game Boy gaming console and was released in 1998. It is also compatible with all of the Game Boy platforms (with the exception of Game Boy Micro). The camera can take 256×224 (down scaled to half resolution on the unit with anti-aliasing), black & white digital images using the 4-color palette of the Game Boy system. The focal length is ~ 50 mm. It interfaced with the Game Boy Printer, which utilized thermal paper to print any saved images, making a hardcopy. Both the camera and the printer were marketed by Nintendo as light-hearted entertainment devices aimed mainly at children in all three major video game regions of the world: Japan, North America, and Europe. N64 Magazine (which has since been superseded by NGamer) dedicated a monthly section to the device. 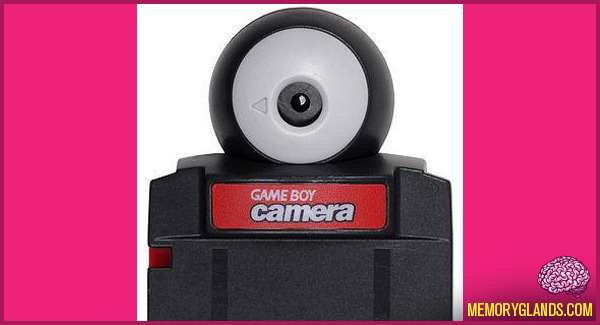 The Game Boy Camera comes in five different standard colors: blue, green, red, yellow and clear purple (Japan only). There was also a limited edition gold The Legend of Zelda: Ocarina of Time version, which contains different stamps from the standard versions and was available only in the USA through a mail order offer from Nintendo Power. The game has numerous references to other Nintendo products. Also, there are a few differences between the North American and Japanese versions, including the unlockable B album pictures and the stamps that can be placed on pictures. The Game Boy Camera was featured in the 1999 edition of Guinness World Records for being the world’s smallest digital camera, though this record has since been broken. Nintendo reportedly had plans to release a successor to the Game Boy Camera for the Game Boy Advance called the GameEye which would take color photos and feature connectivity with the Nintendo GameCube through a game titled Stage Debut, but neither the GameEye nor Stage Debut ever saw release. The Game Boy Camera would be the only handheld Nintendo product to feature a user-accessible camera until the release of the Nintendo DSi.